The little Kia that could! Driving us to Cape Town and back every day! To be honest, this one took quite some getting used to. We still work in Cape Town which means a long drive to and from work every day. In all fairness though, our commute isn’t much worse than many people who live in Cape Town. When we were living in Cape Town, I was spoiled as it only took me fifteen minutes to get to work – it now takes me about forty-five minutes. We also shifted our work hours so that we could avoid the worst of the rush-hour traffic. Our petrol consumption is improved a little by us not being stuck in the rush-hour congestion; something we are grateful for as we are now spending over R100 each day on getting to work and back. Leaving earlier in order to begin work earlier means getting up earlier. We are out of the house by 05h45 each day so have to be fully prepared the night before in regards to food and clothing. This of course, makes our evenings quite busy. The longer commute took some getting used to and was especially hard when we also had to contend with short winter days and were leaving for work and getting to work when it was still dark black night outside. There is a silver lining. 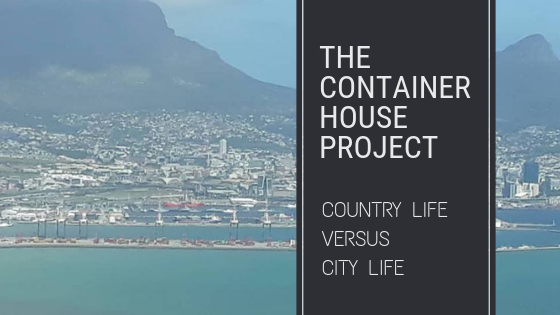 Kevin and I get to enjoy the time together in the car and we can talk about our day and the plans for the container house project as well as other subjects of interest to us. This is what the dogs get up to when they are waiting for us to come home. Being invited to Cape Town for a social event has meant some extra planning. Visiting friends or family in Cape Town now costs us an additional R100+ in petrol if we make a special trip over the weekend. Therefore, if we are invited to visit friends over the weekend, we try and leave earlier in order to run necessary errands. This way we make the most of our petrol costs. We also have to take our pets into consideration. If no-one will be home to feed them at their regular times, we must remember to give them a snack before we leave so that they do not become too hungry while they wait for us to return. The silver lining? We do believe our friends and family enjoy visiting us and we have had some really fun braais (barbecues) with our friends on our plot. We are also making friends in our new area and have had the opportunity to invite them over for some relaxation. I am very relieved that this extremely long till slip isn’t mine! Ouch! If we want to avoid rush hour traffic, there’s no popping into the shops quickly for a loaf of bread after work. I often finish work early on a Friday. I use that time to do grocery shopping in Cape Town while I wait for Kevin to finish up his work for the week. We must plan carefully for our weekly shops as it is not pleasant to run out of something early on in the week and then have to wait until the weekend in order to purchase it again. Thankfully we haven’t run out of anything important yet! We do have a small shop close-by for essentials and emergencies. Cape Town is too far a drive for frozen items such as ice-cream and frozen vegetables. Those we stock up on in Malmesbury. My preference for grocery shopping is Malmesbury. Even on a Saturday morning the supermarkets and their staff are pleasant, relaxed and friendly; a far cry from grocery stores in Cape Town at that time. As expected, we are seeing much more insect life on our plot. One week, I opened the door to let the dogs out and a swarm (?) of moths flew in. Another week, we had an infestation of some other kind of tiny flying insect and were sweeping up dead insects for several days afterwards. A third week had our cat bringing in several frogs every evening. I grew up in a place with a lot of insect activity so it doesn’t bother me very much. I’ll be more upset when we start seeing big spiders. Kevin, however, is finding it a bit annoying as he is the one that attracts the mosquitoes and will have other insects flying around his face. Believe it or not, we’ve already had a few power outages. Previously, the authorities encouraged us not to use water facilities when the power is out. Using water at this time puts pressure on the pumps. However, I don’t think many people listened to this request. It is a good time to get dishes washed (if you hand wash your dishes), and humans showered, when the power is out. I can only presume that with a large network as would be found in Cape Town, the other pumps in the system help take up the slack of those that are currently down so that there is no noticeable difference in water pressure during a power outage. However, where we are now, if there is a power outage, the water pressure in the taps goes down to a trickle, making it difficult to shower. (I should probably mention that due to water shortages in the Western Cape, the water pressure in Cape Town has been reduced and we currently have better water pressure in our new area). Another problem we face with power outages is that of food. We can’t just call Mr Delivery for our dinner, which results in some rather unusual meals, although we do have a gas stove if necessary. Many people dream of living in the countryside where it is quiet and peaceful. Well, it’s not as quiet and peaceful as you’d expect; we are surrounded by livestock and other animals. We have dogs, goats, sheep, donkeys, peacocks, pigs and poultry living nearby so we get to listen to all the animal noises. I would much prefer to listen to happy animals than traffic, and so would Kevin, so we’re okay with it. The majority of the animals around us are pets and are treated well. It’s the same with smells. We don’t have to smell exhaust fumes and whatever revolting aroma is emanating from a nearby industrial area, but we do have to smell the neighbours’ goats. If the day is warm and the wind is in the wrong direction, the goats smell quite bad. I’d still rather smell goats than snack factories and exhaust fumes. This is one I don’t think we expected. As mentioned in my previous post on the changing seasons, the winter rains began and lush green plants sprang up seemingly over night. Now that the rainy season has come to an end, these plants have reached the end of their life cycle and have died. This has left us with our yard covered in highly combustible material. It’s not just our yard, but the whole area! If our neighbour’s yard catches fire, it could easily spread to our yard and endanger our current living spaces and pets. This threat has had Kevin debating the pros and cons of doing a controlled burn. If there is a nearby fire and our grass is already burnt, we will be safer. In the future, we will be putting in fire breaks around our yard to protect ourselves. We never considered this while living in Cape Town. We’re not sure how long it would take for a fire engine to reach us if there was a fire! Country or City; What’s Your Preference? I’d love to know what your preference is. Where would you prefer to live – the city or the country? Where do you live now? I know that not everyone has a choice as to where they live due to circumstances. I’ve always wanted to live in the country, so I am very happy! Judging by the giant hole the dogs dug, they also prefer country life! We lived in a smallholding growing up, I would move back tomorrow if I could! Although, finding a snake in the dining room or stables was never fun… still better than the city! That is a VERY good idea. Kevin might have considered it – I’ll ask him. Of course there are pros and cons to every place – you just have to decide which set of pros is more important to you and which set of cons you can put up with more easily. And I really think that you’ve adapted really well to countryside life and it’s turning out to be great for you! I think that is very true, although I didn’t really think too much about the pros and cons until I had to think about what to write for this post.